(JNS) I haven’t the time or inclination to spend hours in the kitchen anymore. And neither do busy parents, young couples or working professionals. And these days there’s really no need for it. 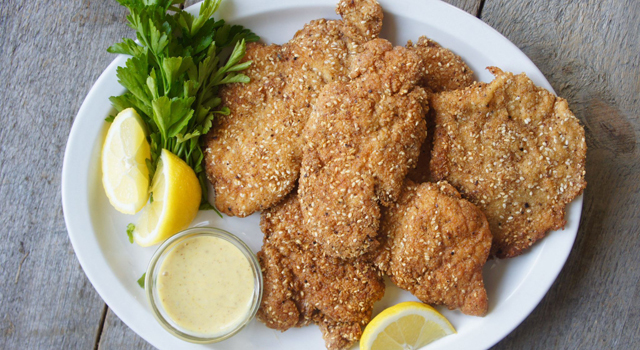 Today, with literally thousands of kosher convenience-food items available in markets, it’s easy to create sensational meals with minimum effort. All it takes is a bit of pre-planning. The emphasis in contemporary kitchens is on healthier eating patterns. We include more fresh produce in our meals. We’re cooking fish and chicken, rather than red meat. And, this year Rosh Hashanah falls early in the season, so the weather is likely to be warm. 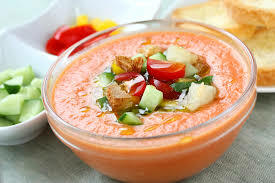 Instead of matzah-ball soup, serve a gazpacho, redolent with fresh shredded basil. Include wedges of crisp Bosc or Asian pear along with apples to dip in honey. Gussie up already-roasted chicken with your own marinade, and end the meal with an apple cobbler mixed, baked and served in one dish. Magic! For those who prefer non-alcoholic beverages: Before filling a water pitcher, insert four to five stems of fresh mint. 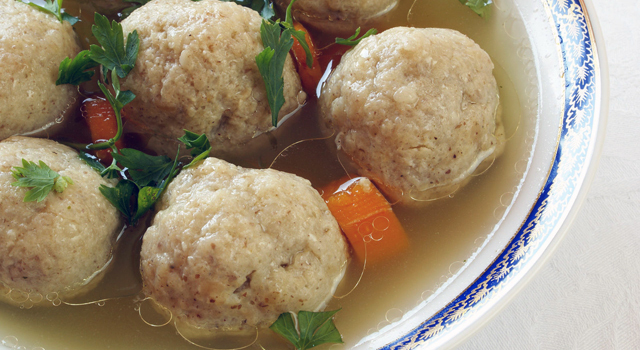 Check out this Rosh Hashanah menu. And add a round challah with raisins, for a sweet year. Each recipe serves 6-8 guests. *May substitute 1 1/2 cups vegetable juice with 1/2 teaspoon each dried basil, dried oregano and fresh ground pepper stirred in. Trim parsley stems. Pull leaves off basil and discard stems. Dill may be used without trimming. Rinse well in cold water. Spin dry all herbs in salad spinner. Place in food processor. Pulse to chop coarsely. Transfer to a large bowl. Add the chickpeas and remaining ingredients. Toss gently to mix. Serve at room temperature. Note: May be made the day beforehand; cover and refrigerate. Preheat oven to 350 degrees. Place pomegranate juice, apricot preserves, lemon juice, ginger, salt and pepper in small microwave bowl. Heat on “High” for 18 seconds, or until preserves are melted. Check after 10 seconds. Stir to mix. Cool slightly. To assemble: On center of 1 sheet of foil, place 1 asparagus spear (2 pieces). Top with a slice of onion, then a salmon fillet. Sprinkle lightly with za’atar. Drizzle a tablespoon of salsa over and then top with a sprig of dill. Bring the long edges of foil up and over the salmon to meet at center. Fold over loosely to create a tight seal. Then fold edges at each side to seal. Place on a baking sheet. Repeat with remaining ingredients. May be refrigerated 4 to 6 hours before cooking. 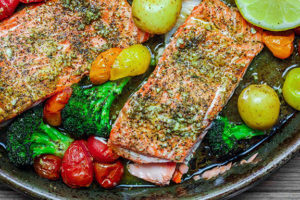 Bake in a preheated 450-degree oven for 18 to 20 minutes, depending on thickness of salmon fillet. A 1-inch fillet will need closer to 20 minutes. Couscous is a pasta made from semolina flour, which is extremely high in gluten. Prepare couscous according to package direction. Stir in currants. Cover and set aside to keep warm. Whisk together the olive oil, lemon juice, cumin or turmeric, salt and pepper. Stir in 1/4 cup mint. Set aside. In a large saucepan, cover carrots with boiling water. Bring to boil and cook for 10 minutes, or until fork-tender. Drain well. Transfer to a serving bowl. Pour olive-oil mixture over and stir gently to mix. Spoon the carrots over the couscous. Sprinkle remaining mint over to garnish. Serve warm. Preheat oven to 350 degrees. Core and quarter apples. Do not peel. Cut into wedges about one-quarter-inch thick. Set aside. In an ovenproof dish, 11×7 inches, place margarine. Set in microwave to melt, 30 to 40 seconds, depending on microwave wattage. To the melted margarine add flour, sugar, nondairy creamer, water and orange extract. Stir to blend. Scatter apple wedges and walnuts over top, making sure to cover the batter. Do not stir. Drizzle with honey. Bake in preheated oven 45 to 50 minutes, or until nicely browned and bubbly at edges. Serve warm or at room temperature.